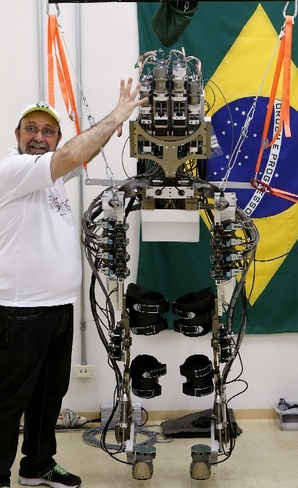 In São Paulo, the World Cup may open with a curious sight: A young, paralyzed Brazilian will stand up, walk to centerfield, and kick the ceremonial first ball.If all goes as planned, aiding the young man or woman will be the newest iteration in a line of thought-controlled exoskeletons. Wearing a snug, 3D-printed helmet and a concealed cap of electrodes, the pilot will simply think about the necessary movements. A backpack housing a nest of wires and actuators will decode the brain waves picked up by the electrode contacts. Using the decoded movement patterns to control the exoskeleton’s limbs, the brain-machine interface will convert human intent into robotic motion. What we do know is that the FIFA World Cup is an unlikely, mammoth stage for science. In 2010, 57 World Cup matches—89 percent of the games played—had a global in-home audience of at least 100 million. That’s 57 Super Bowls over the course of a month. Roughly 300 million people watched the last opening match, and nearly a billion tuned in for a portion of the 2010 final between Spain and the Netherlands. And these numbers don’t take into account the people watching in sports bars and other public settings.The standard routes of modern science communication pale in comparison to the scale of FIFA Brazil. Compare the 300 million opening-match viewers to the 3.5 million Scientific American readers or the one million Radiolab listeners.